Sand Pads is an ideal ocean-view vacation home for a large, or multi-generational family. 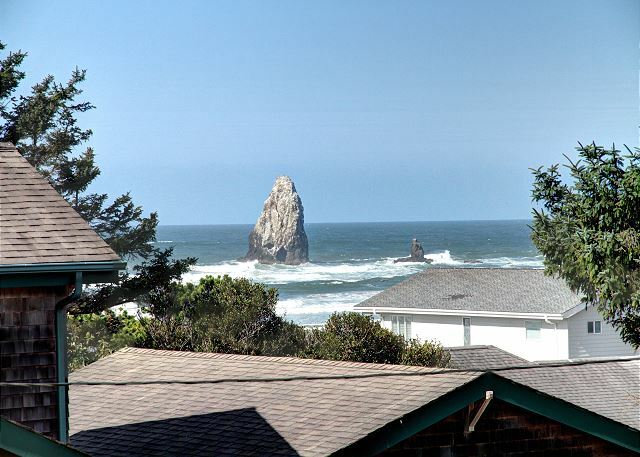 Located in the quiet, Tolovana end of Cannon Beach, this property is within easy beach access at the end of the street, and is a short walk to an outstanding bakery and quaint grocery market. Entering the home on the lower level, this floor creates the sense of a private suite. This cozy room provides sofa seating and a Queen bed around a wood fireplace. Just off this room, a separate Queen bedroom with an attached bathroom has its own private entrance from outside. This level also features an ample laundry room with full size washer and dryer, and another full bathroom. Upstairs is an open great-room floor plan perfect for gathering around the wood fireplace, or watching the ocean while dining or playing board games. The spacious up-dated kitchen features a large island, both functional and able to seat four. Just off the dining room you will find entry onto the massive covered deck, providing additional gathering and lounging areas with outstanding ocean views. Flowing from the great-room down the hallway are two more bedrooms; one with a Queen sized bed and a generously sized Master Bedroom with it's own private half bathroom. Down the hallway you will find a large full size bathroom complete with double vanity and a walk-in stone shower. This property is both cozy and roomy, ideally situated for the family or group eager to create ideal memories. During summer months a 7-night minimum stay with a Saturday arrival date. "Great, quiet location close to the beach! Awesome, lucky weather." It is wonderful to here yyou enjoyed your beachtime! Even better that the weather was amazing last weekend! "I really enjoyed the open floor plan and the well stocked kitchen." Thank you for coming to stay with us, it is wonderful to hear how you enjoyed your stay. "We love the beach and the town!" "Weather- the winter storms and being able to see the water from the house." The storm watching is amazing right now! Come back soon! "The weather was great the whole week." "The rental and its location "
"The kitchen was very well equipped, upstairs is updated and nicely appointed...the large living area open to the kitchen on the second level was perfect for gathering as a family." "Timely access and clean rental; response to reported TV Controller issues. (< 1hr)"
"Location and neighborhood; the rental is frequently improved and has been well maintained over the last 15 years. Management demonstrates customer satisfaction principals." "Close to beach! Plenty of room for another family to have privacy! Lots of windows and ocean view! Fireplace was fun on rainy days! Walk to coffee or dinner! Close enough for perfect walk to Cannon (about 20 min)! Great yard! Good parking! Sounds of the ocean thru windows!" Thank you for your kind words, we are so happy to hear you enjoyed your stay. Come back and visit again soon! "LOCATION! Jjust a block from beach access and only a few steps down to the beach and very close to haystack rock where we were able to view critters at low tide. Fire and Smores on the beach and quick access to downtown. The house is open and spacious and has a view from upstairs. Dog friendly! Great house. We will rent this one again." I am so happy to hear you enjoyed your time with us, Shanwa. Haystack Rock is such an exciting place to visit, I am glad you were able to go! We can not wait to have you back next year. "We went here with our kids and our parents. This house easily fit us with beach views, places to play games, cook and have a good time. " "The Sand Pads provided 3 couples with a wonderful Cannon Beach experience. The home more than accommodated our needs. There was a bedroom and bath for each couple for privacy. The 2 lower units have their own exit which was very convenient. The upstairs kitchen, living and large deck are all up to date, modern and perfect for gatherings. We thoroughly enjoyed our stay and would recommend this unit. Additionally, the Ocean Shores Rental Agency (of the 2 other agencies we used in coastal rentals), was, by far, the most professional and easy to work with." "Wonderful family rental. We loved the location. The covered deck was perfect for our group. Wonderful working kitchen, with large serving counter. It was great for our family reunion. Close to the beach and Haystack Rock. We will be back next year!!" "Our rental house was great-location, facility, everything. The Cannon Beach management people were helpful and efficient. We left the house as good as we found it...want to come back again..."
"Perfect gathering place for a family reunion. Warm and inviting kitchen/living room, comfortable bedrooms, and just a brief walk to the beach. Fantastic outdoor deck provides view of the ocean and Needles. World class support from Cannon Beach Property Management. " "We loved our stay at "Sand Pads". It was a house that was large enough for all of us and you could even find privacy because of the layout. We had our family and their dogs during our stay and everyone was comfortable and happy. The house was quiet and still just a short walk to Haystack Rock which we walked to daily. Close to the beach and there is a Bakery a short walk away. We come every year to Cannon Beach and it was one of our best stays. Love CBPM they are always so professional and helpful. The house was very clean and kitchen has everything you can imagine to use while cooking. Nice Weber grill on the very large deck." "We love Cannon Beach, and Sand Pads fits our large family perfectly. What a pleasure to return for a 3rd time to a house we know so well. It looked clean and welcoming when we opened the door. The grandchildren are very comfortable with the familiarity of the house, and the beach safely up the road. We would like to return every year. " "We loved the quiet Tolvana location with the large covered deck and BBQ grill. The house was near the beach, clean, fresh, and in great shape. We had a wonderful time! Looking forward to our next visit." "We loved this place. The well equipped kitchen, plenty of space for everyone including our furry family members, and SO close to the beach without all the beach traffic. Love, love, love." "We were pleased to see that the deck and living area had a view of the ocean, and we even saw a couple of whales migrating North. The house was clean and spacious and made a great place for a family reunion for our grown children and grandchildren. We were a half block from the beach - a great location!" "Excellent. Unit was clean and well furnished. Unit is not well lit and could benefit from some additional lighting fixtures. Upgraded shower a nice addition." "Sand Pads exceeded our expectations! The nice open floor plan on the upper floor and the huge covered deck made it feel like a cozy home. The location is great - just steps from the beach!" "The weather was perfect the whole week. This house is great for a large family or family get together like we had. " "This is our family's favorite vacation rental. The house is spacious with an open floor plan that provides plenty of room to spread out. The expansive covered deck is perfect for enjoying the view on sunny days without getting scorched! The gas grill is readily accessible and convenient. The kids love to play Frisbee on the lawn." "Sand Pads is wonderful - the perfect gathering place for family and friends. The layout of the house could not be better, with open spaces to visit and comfortable rooms for a great night's sleep. Sand Pads is only 60 yards or so from the beach, and is located on a quiet dead end street where neighbors have dedicated themselves to some of the most beautiful gardens in Cannon Beach. We could not be happier with Sand Pads. (Kudos, as well, to the good people at Cannon Beach Property Management, who are professional, friendly and do a great job of making your vacation feel like a vacation.)" 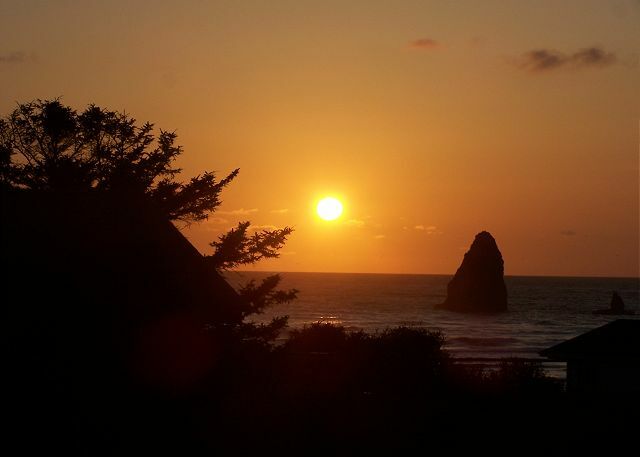 "Our stay at Sand Pads in Cannon Beach was great! The house was well-maintained and clean. The property management company provided good customer service and made the check-in process simple and easy. I would stay here again. We also enjoyed the local coffee shop called Sea Level which is an easy walk from the house. I loved the location and easy access to the beach. We were here for a few days with out grown children, their spouses and our grandson. Very comfortable for everyone." "Four quilting friends spent four fun-filled days in this wonderful vacation rental in February, 2015. We could not possibly have asked for better weather, a more perfect house, or a better time. We loved it here and hope to return - sooner than later. we did not miss a sunrise or a sunset." "This is the second time we have rented Sand Pads, and our family has grown! We love the house. It fits us (5 adults, 4 children, 2 dogs) perfectly. And it's location is ideal. We will definitely do this again. Maintenance is excellent. " "The home is perfect for large family gatherings. Lots of space, great kitchen and an awesome deck. Short walk to the beach. Best of all one can hear the ocean from the deck and the master bedroom." "Perfect location, Plenty of space and well furnished. Love the big deck with built in seating and the dinning table. And loved being able to bring my dog!" "we would definately stay here again"
"Great relaxing time for all. We enjoyed great walks on the beach with family, friends, and our dog. This home is close enough in to walk the beach all the way town for coffee and strolling the shops. We will return again. " "We have stayed at the Sand Pads every year for the past 6 or so years. It is our favorite place away from home! As always, everything was perfect. We can't wait to come back next year!" "Our annual trip was once again outstanding. The house we rented was once again spotless as we entered and had all the room we needed for a relaxing weekend. The kitchen had everything needed to prepare meals and the access to the beach could not be better. This is our second visit to cannon beach and we chose to stay in the same rental because it was just that good. Thank you Cannon Beach property management for a fuss free rental experience and your smiling faces. We'll see you again next year!" "This is a very great lactation for vacation. Very close the beautiful rocks and the sea. Rooms are very enough for us, and every room has different style. 5 stars for this rent. Thank you"
"This is a wonderful vacation rental with a great location and comfortable layout. The property is located 1/2 block from the ocean so it's an easy walk to the beach. The large covered wrap around deck is great for relaxing and enjoying meals outside. The family room is perfect for playing games, jigsaw puzzles, or eating inside. The kitchen is recently updated with a nice counter top. The 4 bathrooms are especially convenient and allow everyone to have their own space." "From the babies to the 60s, our family thoroughly enjoyed Sand Pads. Location is superb -- a safe but easy distance from the beach. Walking distance to fabulous coffee. Near the action of "downtown" Cannon Beach, but not too close. Options for dining inside and out on the deck-with-a-view. Private lower level for those needing get away for naps or a rare moment alone. We'd return!" "There were 7 of us women who needed to get away, and what a perfect spot! We walked on the beach, shopped, had a massage, ate and drank and did 2 puzzles! Thank you!" "My only comment or complaint is the need for a higher toilet downstairs, because I'm old & somewhat crippled, it is rather difficult to use the lower ones. The house is wonderful for a family stay - 3 generations of us have used it for a number of years. Each year the owners update in some way, so it just keeps getting better. So maybe next year I will get my wish for a higher toilet & maybe a grab bar, downstairs! And maybe, the following year, a new sofa downstairs." "Love our week at the beach house. This year we felt so at home. When we realized it was out 7th year we understood why. The house has everything you could possibly need for a relaxing stay at the beach. " "Our group of 8 family members stayed at Sand Pads for a week the end of June. We had originally booked the house for five nights but we having such a good time we weren't ready to go home. We looked online and it appeared there was one more night available. We called CBPM and were able to stay an extra night! We were so happy to find a home to rent that had enough beds and baths for all our family members, had a great location, an open kitchen, living, dining space, was reasonably priced and took dogs. We went south as far as Tillamook for a day and a couple of family members golfed at Gearhart a couple of times. We spent lots of time on the beach, went hiking, ate at local restaurants, barbecued at the house, put a big puzzle together and shopped at Cannon Beach. We really appreciated the big covered deck and loved having coffee there in the morning looking at the beautiful view. 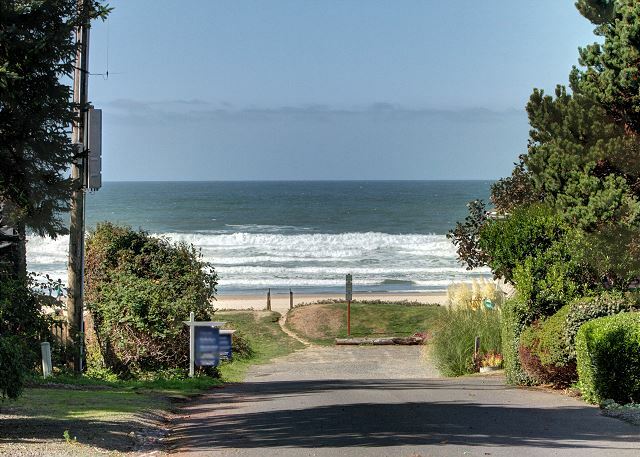 Our group has tried several houses in several locations on the Oregon and Washington coasts but this is the one that everyone wants to keep coming back to. The house is not new and every room is not updated but it is cozy and comfortable. We found the kitchen was stocked with pretty much everything we needed to cook and there were plenty of towels & bedding for the beds. We also appreciated that there is a washer and dryer and made good use of them too. CBPM was easy to work with - I would highly recommend them and this property!" "This is a wonderful rental property, boasting a quiet location and plenty of room. Enjoy your meals outside on the expansive covered deck, or inside in the comfortable great room. Bring your frisbee, boccee ball, and croquet set to play games on the side lawn. Then BBQ on the covered deck and stroll a half block to the beach for a bonfire and smores for dessert. Delightful!" "Everything was great. We really enjoyed our stay. Only thing missing was a good, sharp large kitchen knife and a bread knife. Keep up the good work CBPM!" 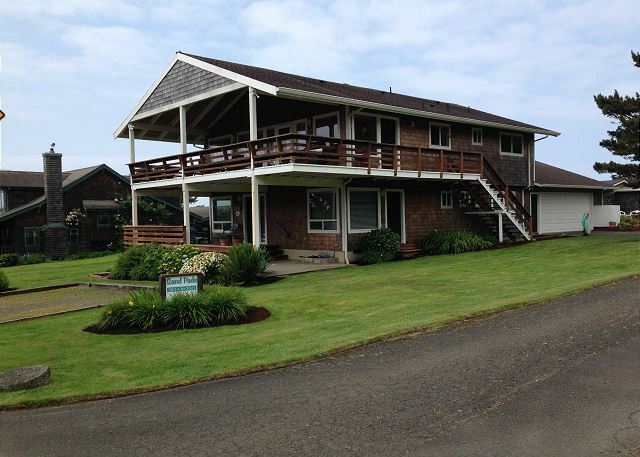 "Sand Pads is a perfect house for a getaway in Cannon Beach. The management company has it in tip top shape. It is less than a block to the beach and near Haystack Rock. The kitchen is fabulous! Would like to come back in the fall when I can use the fireplace." "This is our third year spending spring break at Sand Pads - our experience is always just wonderful and we would recommend CBPM to anyone planning on vacationing in Cannon Beach!" "We had a great tim. Perfect location with everything we needed." "Great place, fits lots of people comfortably and is very close to the beach. The kitchen and the deck are awesome, the one issue we had was there was no gas grill (at least that we could find)." "I've stayed at this home 8 times, and it is the perfect spot to relax. The house is clean, has great amenities, and has been updated almost every time we've come. We always have a fantastic time." "Our first choice for our New Years stay was a beachfront property but it was being remodeled. CBPM gave us a few options and we chose Sand Pads. We were all very happy with the location which had a good ocean view and was a short walk to the beach. It was nice to be close to Haystack Rock. The property served all our needs well. Furnishings were a bit dated but comfortable. " "Spent four days at this house. The location is ideal, nice view and walking distance to town. Loved the kitchen. A great stay." "This house fit us perfectly. Close to everything, yet a sense of quiet and vastness. The children ran and played on the beach all day, and we were totally relaxed. A great, great family vacation." "We may come back again sometime." "Sand Pads is a fantastic beach home. Great location, and a warm and inviting floor plan and decor. To top it off, the property managment company is top-notch in every respect, and as professional and courteous as one could imagine. Highly recommended." "We keep coming back. That should say a lot!" "We've enjoyed this house for many years, and we keep coming back! The quiet location and overall roominess are wonderful. The wrap around covered deck is great for eating outdoors or simply enjoying the ocean breezes on warm days. The large side lawn is convenient for playing games with the little ones. This year (2012), the upstairs bathrooms were remodeled and the fridge was replaced. Beautiful!" "Our family had a fantastic time! The house, the proximity to the ocean and Cannon Beach in general was just wonderful. We plan on coming back and making this an annual destination." "Sand Pads is very well maintained, although slightly dated, rental unit (the kitchen, however, has been remodeled). The home is well stocked with all the necessary supplies. There are also cupboards full of games and a nice selection of reading material. The beach is just a short walk down the street. We were very satisfied with our stay." "The 7 of us had a fabulous weekend catching up on family business, relaxing on the deck, walking on the beach and enjoying the sun. We are all quilters and were delighted to find that this house is set up to be a quilters retreat. We hope to plan a return visit this fall for one of our family quilting weekends. It would be nice if the chairs around the table had a little padding. They get a little hard after a few hours of quilting. "We really enjoyed our stay. Quiet street, beautiful view, cozy and clean home just a few houses down from the beach. It was just what my family needed!" "The location of this home is amazing and it fit two families well. We will definitely come back again." "I try to find a place every spring break to spend a few days at the beach with family. Sand Pads is it! Tons of space, close to the beach, great views and just all around perfect. We all had a private space to sleep and lots of room in the main area of the house to craft, eat and hang out. What a great place for a family or group of friends." "We found Sand Pads to be an exceptional vacation rental. The bedrooms were great for the six of us, the dining and living room accomodations were very comfortable, and the kitchen was fabulous. The easy walk to the beach was also greatly appreciated. Cannon Beach Property Management was most accomodating, making sure we had a barbeque and seeing to it that anything we needed was supplied. This was a great visit, made even better by the nice place we stayed in." "We had a wonderful time quilting, enjoying the spacious living area, the beautiful view and amazing beach"
"For the 10 plus years since our 40th class reunion we have been getting together once a year for a "Girls Vacation". This year was a fantastic stay in Cannon Beach at Sand Pads our home base for seeing the Oregon Coast. I live in WA and have been to Cannon Beach numerous times - it is my favorite coastal vacation, so I was tour guide. My friends came from MA, MN and CA and they all loved the house and the location a half a block from the beach. The house had everything we needed and the great room was a wonderful gathering place in the morning for breakfast as well as wine time in the early evening to watch the sun setting. They all wanted to return and bring their husbands they loved Cannon Beach so much." "This is a great house - fully stocked and the master bedroom bed is VERY comfortable (all beds are comfy according to my other guests). Great open floorplan in the living area and wonderful large deck. My mom stayed in one of the downstairs bedrooms and enjoyed the privacy of the downstairs patio and her own TV. Neighbors are very friendly. Out of the MANY houses we've rented from CBPM that allow dogs, this is my favorite - best value and location. FYI, the yard is not fenced for dogs." 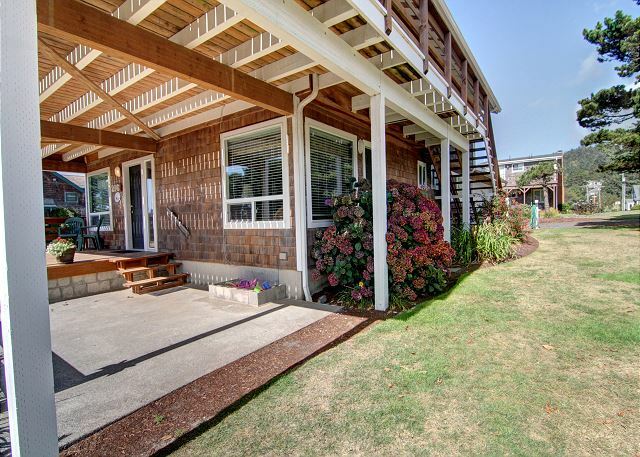 "We love this Cannon Beach location - close to the water with large covered decks upstairs and down, where you can relax, eat meals, or play games while enjoying the ocean breezes. The side lawn is great for frisbee. The bedrooms are spacious, but all have queen beds (so you may want to bring an extra air mattress for the kids)." "Easy beach access and plenty of room to spread out for a group. Nice newer kitchen. We had a little difficulty getting the heating set correctly at first-some rooms would end up too hot, others too cold. Quiet area. Clean house. We made good use of the games, puzzles, and books since the weather was fairly rainy. OK view from second floor." "Wonderful home which we hope to visit again, when the number of people calls for spacious accommodation. Nice kitchen, well outfitted, lots of room. A little removed from the beach, but some ocean view. Very comfortable home. Everyone enjoyed it." "Sand Pads was a great place for a gathering! We had a College Reunion and had wonderful time. Plenty of bathrooms, beds, privacy and a great view! The living room was a great place to gather in, and dining room table had seating for 8. We loved the large island in the kitchen and cooking was easy with the well stocked kitchen. I would highly recommend this to everyone. Wonderful Home! " "Sand Pads was a wonderful place to celebrate my 50th birthday with my girlfriends. Plenty of bedrooms and bathrooms for the 8 of us to spread out. The house is warm & wonderful and we had a great time-it felt like home but better!" "This house easily accomodated myself, husband, teenage son, mom, aunt & uncle and 2 dogs. I had stayed here before & knew I wanted to come back. The upper deck is perfect - you get a good peek at the ocean in a couple places and the built in seating is great. The owners have re-modeled the kitchen beautifully. It's really nice to have 3 + bathrooms and separate entrances and a side yard for the dogs. The majority of neighbors are homeowners and very friendly; hopefully they tolerated us all, including the dogs. This house is very well stocked and CBPM does a great job of keeping it clean. The water doesn't get very hot which may be a plus for some, but I do enjoy my hot baths every once in a while... We booked this house again for next year's July vacation - looking forward to more family gatherings." "Everone had their own livining accomodations. The private access to each of the downstairs rooms was convienient for our late owls. " "We've enjoyed this property for many years. It's a great location, close to the beach with plenty of room on the two covered decks to stretch out and relax, regardless of the weather. The kitchen was recently remodeled with granite counter tops and white cabinets - a nice face lift!" "My friends that slept in the twin beds said the mattresses are getting very uncomfortable(compared to past visits) made their backs hurt. We like the kitchen remodel. We love this house, especially the wonderful covered deck." "Only negative was lack of extra towels and beach towels that were supposed to be in the laundry room. Otherwise, great location, very comfortable." "We thought the property was great for our family of 8 - right amount of beds and baths. I'd do it again in a heartbeat." "Our only complaint was the twin beds they were very uncomfortable for adults"
"This is the perfect beach house...lots of room, spacious with big windows and great views. BBQ on deck was well used." "We have stayed at Sand Pads twice and would rent it again. Wonderful for families and a very comfortable home. " 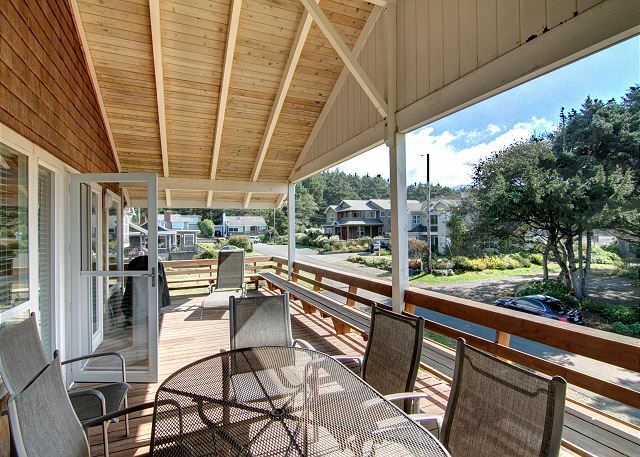 "This is our favorite place to stay in Cannon Beach - close to the ocean, large covered decks (upstairs and down), with plenty of room to stretch out and relax! This year, we were delighted to find a number of improvements to the property -- new dining table, deck furniture, Weber BBQ, windows, and outdoor siding. We had a wonderful stay and look forward to our next visit!" "The house was great. We had three families and we were all able to have our own separate areas, yet the living, dining, kitchen were all spacious and open. It was a wonderful stay, right up the road from beach access, quiet, and close to a great coffee shop and grocery store. I would stay there again and again." "We had absolutely gorgeous weather, the house was wonderful. One of the cleanest and well maintained houses I've stayed in. The master bed was VERY comfortable. The next door neighbors were very friendly. We enjoyed the rabbits hanging around and the huge deck and just all around had a great energy to the house and area. Short walk to the beach was so nice. It was a perfect stay all around." "We had threee generations of family here and the layout (as long as you can climb stairs) is great. TV and beds down gave kids a place to hang away from the adults. Kitchen well equipped. The only thing I can think of to make this home better would be to move it right to the beachfront. " 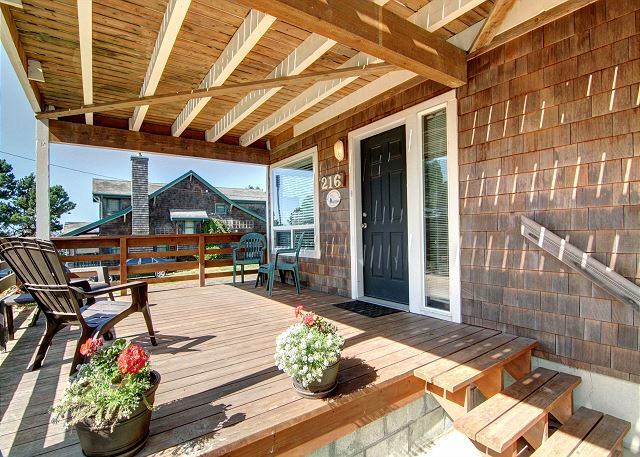 "This is our favorite rental location in Cannon Beach - close enough to hear the surf, but without the glare of the sun off the water. 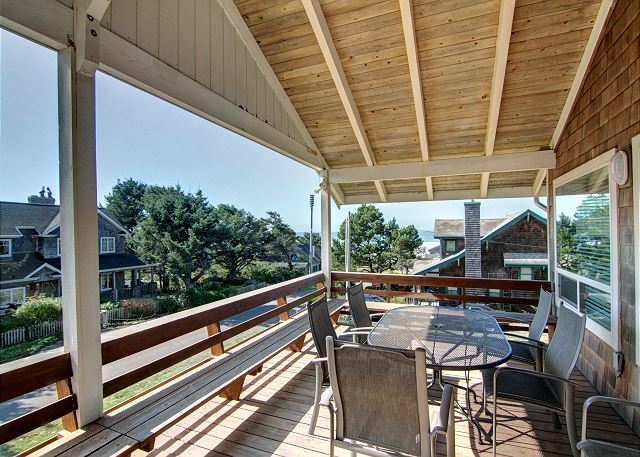 We love the large covered deck where you can relax, eat meals, or play games while enjoying the ocean breezes. The house is very comfortable for 8 - with plenty of space so that everyone has some privacy. The new queen bed in the downstairs rec room is great. Thanks!" "We really missed the "old" diningroom table ... especially since we were there for a "beading" weekend. I told everyone about the great "big" table where we could stretch out to do our crafts. That was the only disappointment."